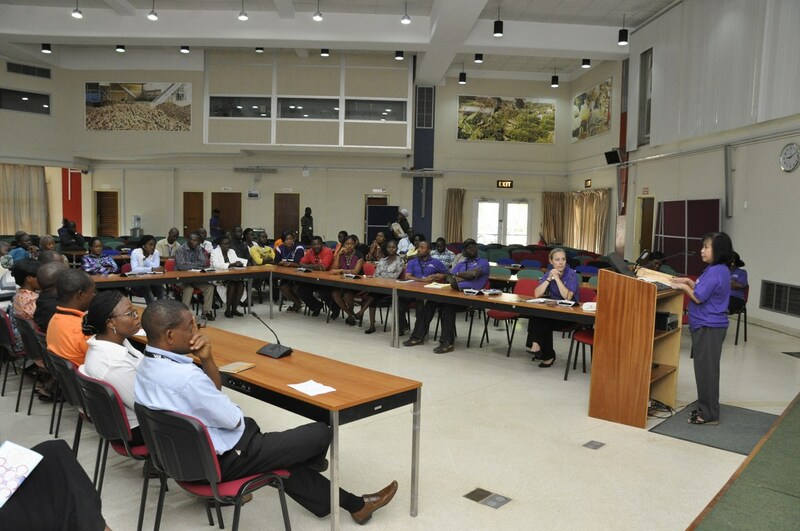 IITA’s Human Resources Services (HRS) had conducted seminars for all staff on the Institute’s harassment and discrimination policy on 26 and 27 May at the IITA Conference Center in line with the CGIAR’s campaign on gender and diversity. The policy was launched last June 2014. Mrs Lilian Mendoza, Head of HRS, explained that the purpose of the seminar was to raise awareness on the existence of the policy, IITA’s stance on the subject, what constitutes harassment and discrimination, and how victims can get help in IITA. IITA is a global organization and has 1000 nationally recruited staff and 200 international staff. With this multiracial workforce IITA is committed to providing a work environment that respects the dignity of individuals and is free of all forms of discrimination based on ethnic, social, or political background, color, nationality, religion, gender, disability, or sexual preference, and devoid of both general and sexual harassment. Mrs Mendoza address members of staff during the awareness seminar. It is imperative to note that diversity skills are critical to IITA’s effectiveness in working with partner organizations and the end-users of the knowledge and technologies developed in meeting our fundamental objectives of fighting hunger and poverty. At the seminar, staff members were encouraged to report any cases of harassment and discrimination and were assured of their privacy and protection against reprisal.